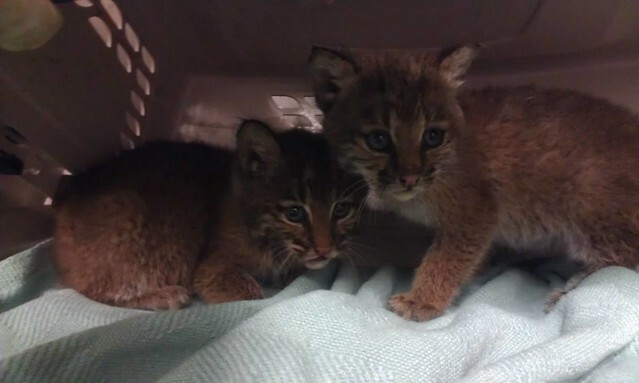 On May 20th, the Wildlife Medical Clinic took in two very unique patients – a pair of bobcat kittens. The animals had been found on a Friday in a train car in the Tuscola area; since the finder didn’t know for sure if the cats were orphans, he left them alone for the weekend to see if the mother would return. When he checked again on Monday, they were still there – hungry and scared. Even though it may seem strange to leave two young animals alone, the finder made a very good decision. All too often, the clinic receives “orphaned” animals that have been unintentionally kidnapped by well-meaning citizens. Since mother animals have to leave their babies alone for periods of time to find food or just to avoid attracting attention to a nest, people sometimes find these healthy animals and assume they are orphaned. By not immediately catching the bobcats, this man gave them their best chance at being reunited with their mother, but after two days alone, it was clear she wasn’t coming back. Upon further investigation, we learned that the train the cats were found on came up from Louisiana. Likely what had happened was that somewhere near the train’s point of origin, the mother bobcat left her kittens in the car for safekeeping while she went off to hunt. Unfortunately, the train was scheduled to depart before she could make it back. When the cats were admitted, they were dehydrated, thin, hungry and full of intestinal parasites. After providing fluids and medications to treat the parasites, the staff at the clinic set them up in an isolation area where they would see and hear people as little as possible. Because bobcats are relatively large carnivores, it is imperative that they never associate humans with food or positive interactions. A bobcat that sees a human as a food source, a competitor or even a friend, is very dangerous and cannot be returned to the wild. Luckily, these cats had no love for humans – even at one and one and a half pounds, they were growling, hissing and spitting. The bobcats have been in care for three weeks now and are healthy and aggressive. Both of the sisters have more than doubled their intake weight, dining on rats, mice, chicken and fish, and they are ready to move to the next phase in their rehab process. Next week, the clinic director and one of the managers will be transporting the bobcats to a licensed rehabilitation center in southern Illinois. 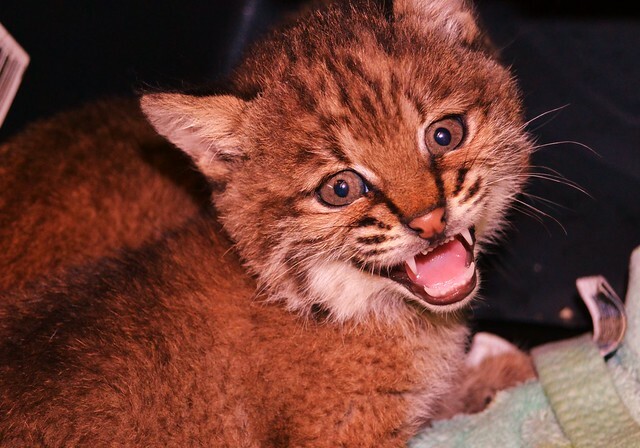 This center has experience raising and releasing orphaned bobcats and even has a specific enclosure for the species. At their new home, the cats will continue to grow, learn to hunt and acclimate to the sights and sounds of the outdoors. Once they are old enough and capable of fending for themselves, the bobcats will be released to live out their days in the wild where they belong.